Honister pass is a fairly inaccessible climb in the north West Lake District. To get there invariably involves cycling up many other Lake District hills, but it is worth the effort as it a great climb, with equally superb views. It is a great climb from both directions. 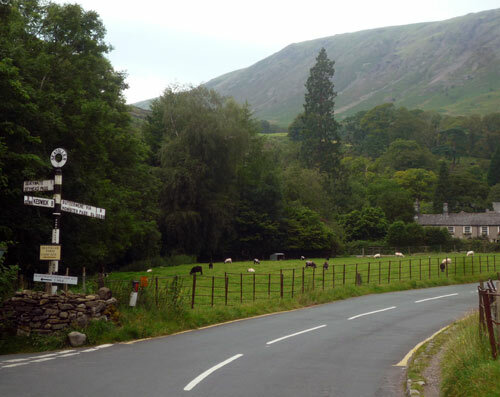 Starting in Keswick you will travel south down the East coast of Derwent water towards Borrowdale. Just before the village of Seatoller, you take a right turn on the B2589. 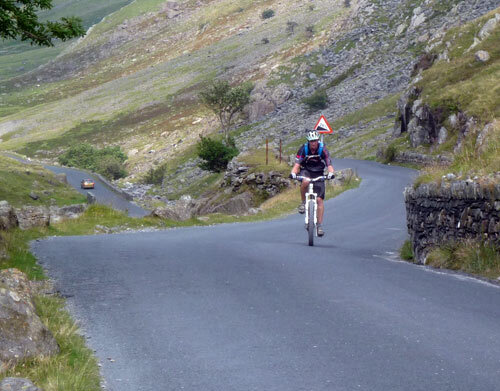 There is a 2 mile gentle introduction to the climb as you go up the valley at a very gentle gradient. However, as the road bends round to the right you leave the valley and start the climb proper. There is a steep section of 18% before a slight recovery in the middle. 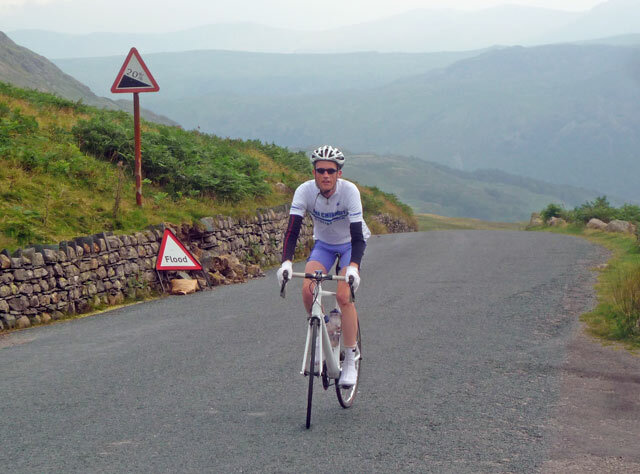 The last third of the climb is the hardest as the gradient gets up to 22% before the final drag to the summit, where you will see the Honister Cafe built out of locally produced slate and festooned with non-locally produced signs, which somehow don’t fit into the environs. 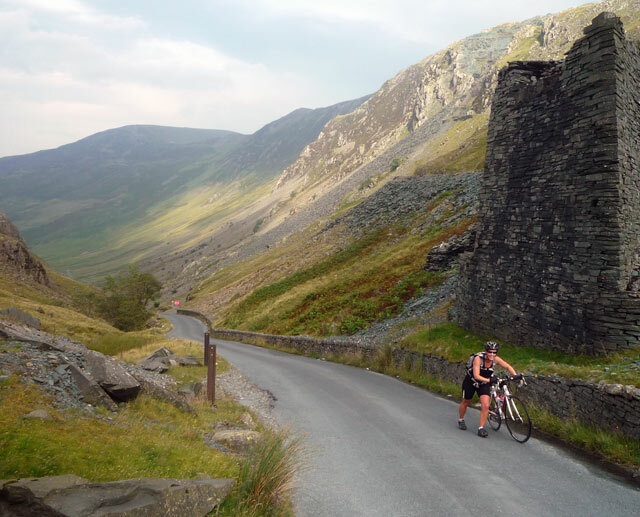 I rode Honister Pass in 2011 on an epic Lake District ride, which ended being over 110 miles and 4,000 m of climb. Honister was one of the best climbs, though that might have been because it was one of the earlier ones. Honister pass Looking West towards Buttermere. The climb begins from the picturesque setting of Buttermere Lake. The thing about Honister pass from this direction is that it gets steeper and steeper as you go further up. Always worth bearing in mind as you start the climb. The last 2.3 miles averages 7% as you climb 270 m. But, it is the last section which is the real leg breaker, 20% for a considerable time. 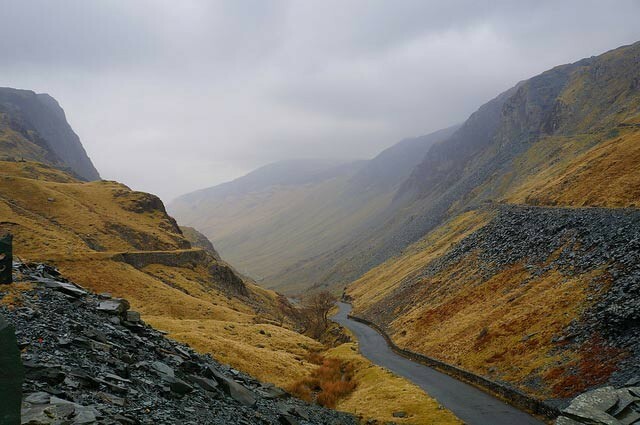 In 2013, the Tour of Britain went up Honister Pass in the driving rain, it split the peleton very nicely. Everesting – 33*4.6 = 152 miles. Super climb and as spectacular as it gets in the NW Lakes.One can cycle a nice loop from Keswick via to The Whinlatter Pass.Cycling along side Crummock and Buttermere is magical.